In these Terms and Conditions “we, our, us, Allergy Lifestyle” refers to “Allergy Lifestyle Ltd.”. This page (together with the documents referred to on it) tells you the terms and conditions on which we supply any of the products (“Products”) listed on our website www.allergylifestyle.com (“our site”) to you. Please read these terms and conditions carefully before ordering any Products from our site. You should understand that by ordering any of our Products, you agree to be bound by these terms and conditions. By placing an order through our site, you warrant that you are (a) legally capable of entering into binding contracts and (b) that you are at least 18 years old. After placing an order, you will receive an e-mail from us acknowledging that we have received your order. Please note that this does not mean that your order has been accepted. Your order constitutes an offer to us to buy a Product. All orders are subject to acceptance by us, and we will confirm such acceptance to you by sending you an e-mail that confirms that the Product has been dispatched (the Dispatch Confirmation). The contract between us (Contract) will only be formed when we send you the Dispatch Confirmation. The Contract will relate only to those Products whose dispatch we have confirmed in the Dispatch Confirmation. We will not be obliged to supply any other Products which may have been part of your order until the dispatch of such Products has been confirmed in a separate Dispatch Confirmation. This Site is not a source of Medical Advice. The content of this Site is presented in summary form, is general in nature, and is provided for informational purposes only; it is not intended nor recommended as a substitute for professional medical advice. You should not use the content of this Site for diagnosing a health or fitness problem or disease. Always seek the advice of your physician or other qualified health provider regarding any medical condition or treatment. Nothing contained on this Site is intended to be for medical diagnosis or treatment. Never disregard medical advice or delay in seeking it because of something you have read on this Site. We may provide links to other web sites or resources. These are provided purely as a matter of convenience and we do not endorse the contents of those web sites. We cannot give any undertaking those products you purchase from companies to whose website we have provided a link will be of satisfactory quality. We are not responsible for the availability of these web sites, nor will we be liable in any way for any loss or damage, which you may suffer by using those web sites. If you decide to access linked third party web sites you do so at your own risk. The price payable for the goods you order is as set out on our website at the time you place your order, except in cases of obvious error. We are under no obligation to provide the Product to you at the incorrect (lower) price, even after we have sent you a Dispatch Confirmation, if the pricing error is obvious and unmistakeable and could have reasonably been recognised by you as a mis-pricing. Prices include VAT where applicable and are exclusive of delivery charges. Delivery charges will be added to the price of the goods at checkout. It may be necessary to change prices either up or down, from time to time, including any alterations to the rate of VAT. Allergy Lifestyle reserve the right to withdraw any goods from the website at any time and shall not be liable to anyone for withdrawing any goods from the website or for refusing to process an order. Payment for all Products must be by credit or debit card. We accept payment with Visa Credit, Visa Debit, Master Card and Amex. We aim to dispatch most goods within 2 working days of receipt of your order. Personalised goods will take longer, please allow up to 5 working days for dispatch of personalised items such as labels, tags, jewellery and translation cards. Ireland and UK – Please allow 3 to 5 working days for delivery from dispatch. Rest of the World – Please allow up to 10 working days for delivery from dispatch. Delivery of the Goods shall be made to the customers address specified in the order and the customer must make arrangements to take delivery of the order when the order has been confirmed. If you order Products from our site for delivery outside the European Union, they may be subject to import duties and taxes, which are levied when the delivery reaches the specified destination. You will be responsible for payment of any such import duties and taxes. Please note that we have no control over these charges and cannot predict their amount. Please contact your local customs office for further information before placing your order. All rights, including copyright, for this website are owned by or licensed to Allergy Lifestyle Ltd. All intellectual property of Allergy Lifestyle Ltd. such as trademarks, trade names, patents, registered designs and any other automatic intellectual property rights derived from the aesthetics or functionality of the Website remain the property of Allergy Lifestyle Ltd. By using the Website you agree to respect the intellectual property rights of Allergy Lifestyle Ltd and will refrain from copying, downloading, transmitting, reproducing, printing, or exploiting for commercial purpose any material contained within the Website. 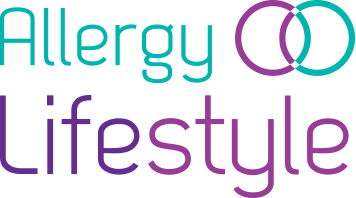 All notices given by you to us must be given to [Allergy Lifestyle] by e-mail at [info@AllergyLifestyle.com] or in writing at our head office. We may give notice to you at either the e-mail or postal address you provide to us when placing an order. Notice will be deemed received and properly served immediately when posted on our website, 24 hours after an e-mail is sent, or three days after the date of posting of any letter. In proving the service of any notice, it will be sufficient to prove, in the case of a letter, that such letter was properly addressed, stamped and placed in the post and, in the case of an e-mail, that such e-mail was sent to the specified e-mail address of the addressee. We have the right to revise and amend these terms and conditions from time to time. You will be subject to the policies and terms and conditions in force at the time that you order Products from us, unless any change to those policies or these terms and conditions is required to be made by law or governmental authority (in which case it will apply to orders previously placed by you), or if we notify you of the change to those policies or these terms and conditions before we provide you with the Dispatch Confirmation (in which case we have the right to assume that you have accepted the change to the terms and conditions, unless you notify us to the contrary within seven working days of receipt by you of the Products).